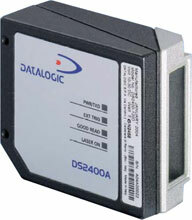 The Datalogic DS2400A has been discontinued. No direct replacement is available. The Datalogic DS2400A grants improved productivity, greater profitability and more efficient processing in the most common warehousing, shop floor and OEM applications, providing a competitive advantage to any company. The DS2400A combines long distance reading, high scanning speed and very compact dimensions with the new ACB Advanced Code Builder, the new Datalogic proprietary software able to decode partially damaged or normally unreadable barcodes due to high tilt angles.